This is the same type of technology that is used today by the entertainment industry and television stations for weather forecasts and news programs. We apply this same type of technology for business, industry, museums, and non-profit communications applications. 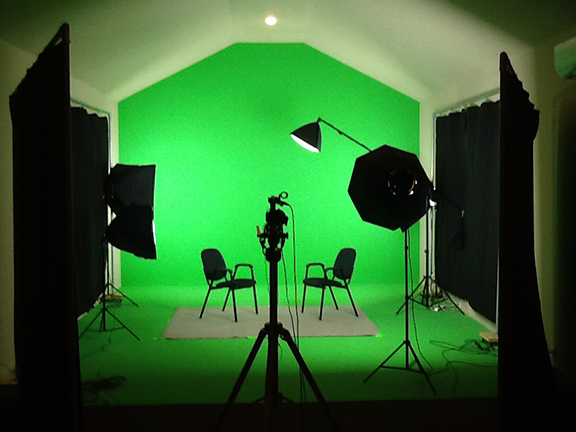 To view more examples of our oral histories using green screen technology please go to www.thehistoryconnection.org and click on the oral histories tab. if required as part of the final video. enhance the video message. Just click on the arrow to view the video. You can view in full screen without any loss of picture quality. You will see photos in the background changing as the interview progresses. Using our green screen studio, we can videotape your presentation and then place photos, videos, movies, power point presentations, audio, and other media behind your presentation showing your products, services or personal/company information in the background. This provides for a very unique, personal, and cost effective audible and visual presentation that can be used to train employees or send to a company's present customer base updating them on new products and services. The possibilities are endless! To help our clients to more effectively Train, Communicate, Advertise, and Market their Products and Services to their present customer base, and/or to potential new customers, using green screen technology inhouse and/or using the Internet. We simply offer a one-of-a-kind, modern day solution to that old saying that "a picture is worth a thousand words." Our studio facility is 42 feet long, 18 feet wide, and 15 feet high. We have a profesional lighting system set up for video and/or photography. Our studio is also available for individuals and/or organizations to rent in order to produce their own presentations using their own cameras and/or lighting equipment. Pricing for our in-house services or for rental of our facility is based on the scope and time required to complete the project.